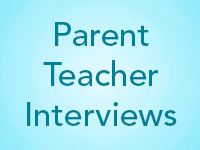 Parent-Teacher interviews will be conducted the last two days of Term 1. Thursday evening APRIL 3rd and Friday morning APRIL 4th. • For further information on how to book, teacher availability and where to find teachers at the interview sessions, please download this attachment. For parents who wish to not use the online booking they are encouraged to contact the office administration via telephone (03) 57216322 to make their booking with the office personnel.